A PDF or electronic proof is more than just a digital copy of your label. 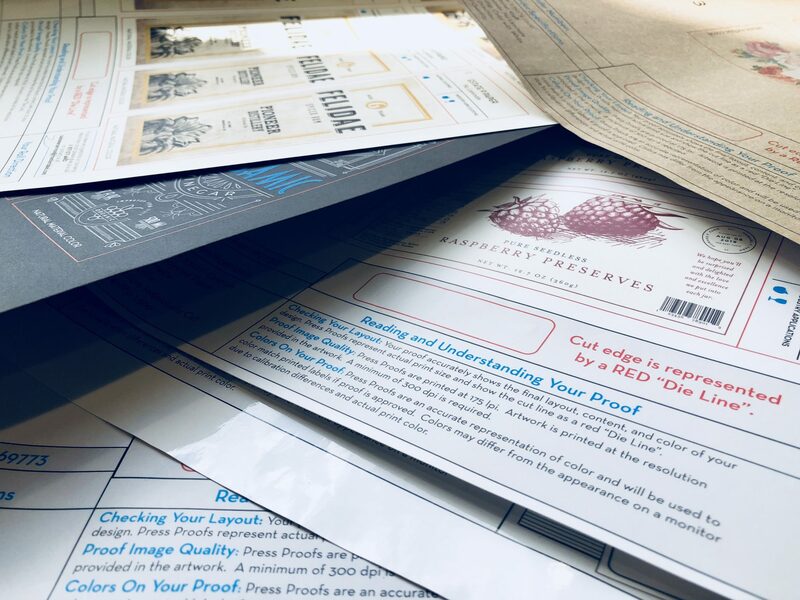 Our prepress team takes time to prepare your files for press, making sure all fonts and images are in place, as well as double checking that the format of your label fits neatly within the die you selected. 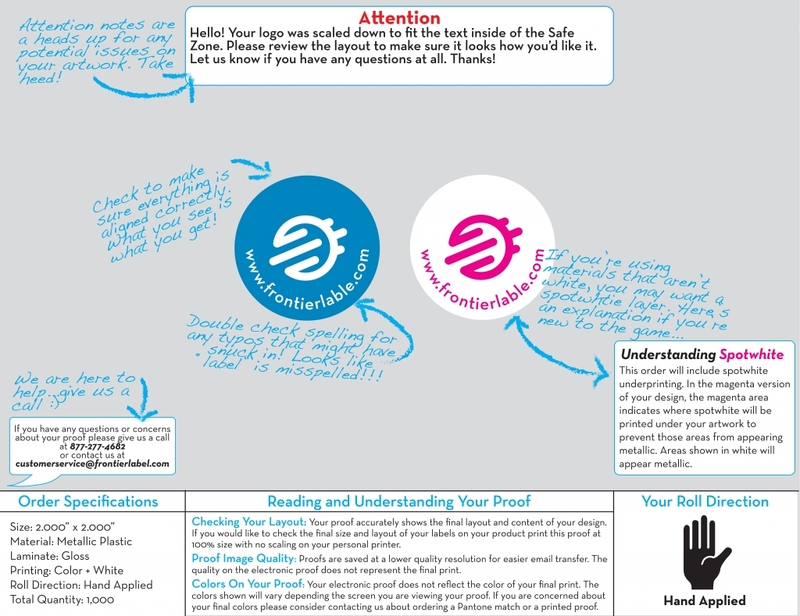 It’s a great way to see your label once more before sending it off to press, but what else can your proof do for you? Worried the barcodes won’t scan? Download a free barcode scanner (you’ll find dozens on the App Store, like QR Code Reader) on your mobile device and scan the printed PDF proof! If they don’t scan on the proof, they likely won’t scan on the final label. If you need to, you can send a higher resolution version of the barcode to our helpful team and we can switch it out for you, or ask us for further assistance if necessary. We’re always here to lend a hand! While you’ve got your proof printed out, you can check a few more things. If your label is going to wrap around a bottle or jar, especially if it’s shaped like a cube instead of a cylinder, make sure all text and design elements are laying right where they need to be. If you want the label edges to overlap, make sure you’re not accidentally covering up text when you lay one edge on top of the other. You would be surprised at how many folks realize they’ve made a typo after the label has been printed. Ingredients list, nutrition facts, even their website (yikes!). Give your PDF proof a thorough read-through for any spelling errors. You could even ask a friend or colleague to take a look at your proof before hitting that final “Approve” button. Pay attention to any big red “Attention” notes. They’re not just for decoration! Sometimes, our prepress artists notice potential issues with your artwork that they want to make you aware of. For instance, they might notice that your logo looks a bit pixelated in comparison with the rest of your label, or maybe they want to give you a heads up that they had to scale down your artwork slightly in order for it to fit the die you chose. Whatever the case, read the notes and give us a call if you have any questions. What is spot white, anyway? If you order your label on a metallic, clear, or specialty material like Kraft or Black Vellum, you will likely need a spot white layer for the areas you wish to appear opaque. Since it’s impossible to accurately show this in a digital format, we use a simplified magenta version to indicate where the spot white will be. You can read up on spot white here, or give our friendly Experience Team a call if it doesn’t quite make sense. If you notice any issues on your proof and need to submit corrected artwork, sending new files in is a breeze! All you have to do is email the file(s) over to experienceteam@frontierlabel.com with your order number, and we will take care of the rest. We’ll have a new PDF proof sent over quicker than lightning. The benefits of a PDF proof are limitless, and we strongly recommend choosing one for every new label you order. We are as passionate about your labels as you are, and we want to help you get the best labels in every way we can.